Team spirit is alive and well in American schools! It's 6 AM in Harmony, Minnesota and you just awoke to the sound of the Fillmore Central High School marching band playing the school song. Good morning! It's time to "Wake Up To The Band." You're the recipient of the grand prize in one of the raffles that helps the Fillmore Central Band raise about $10,000 per year. This brassy alarm clock is just one of the creativeand good-humoredfundraisers that enables this rural community to provide its students with opportunities often afforded only to students in larger cities. "The benefit of a small town is that people do what it takes to make things happen," says Band Director Lane Powell. "When I call on parents, students or supporters to volunteer, the response is overwhelming." Community support is so strong, Powell says, that for the band's recent trip to Walt Disney World in Florida, most students paid $0 out of their own pocket. Students had multiple opportunities to participate in group fundraisers and earned credit to cover their trip costs based on their fundraising efforts. Fillmore Central High School serves the neighboring Minnesota communities of Harmony, Preston and Fountain, where the region's combined population is only 4,000. Total enrollment at the high school is just 207, so it's amazing to learn that the school offers a broad range of music programs. In addition to concert, jazz and marching bands, Fillmore Central provides weekly private lessons for each student and weekly sectional rehearsals. The jazz band hosts an artist-in-residence series each spring, featuring clinics and concerts for students plus a grand finale concert for the community. "The cooperation here is amazing," Powell says. "The administration is flexible to allow our jazz band students to attend clinics with our artist-in-residence. The football coaches ensure that students can be in both band and football. Local restaurants donate food for our guest clinicians. The grocery store donates water for rehearsals. The local Harmony Arts Board works hard to help the arts flourish in the area." Students don't take this community support for granted. They participate in large numbers: a full fifty percent of the student body is in the band. 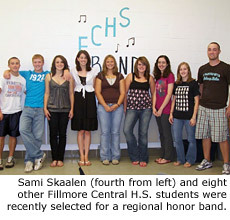 Senior percussion player and class president Samantha Skaalen is among the students who have embraced the music opportunities at Fillmore Central. She performs in the marching, concert and jazz bands, plus several choral groups including mass choir, women's choir and Tapestry. She also serves as a student representative for the Harmony Arts Board. "If you were to ask anyone on the streets about the band, they would only have positive comments," Samantha says. "The community loves how our program has grown. People support everything we do, from fundraisers to attending concerts, even if they do not have family performing. We would not be able to do what we do if it wasn't for their endless support. We cannot thank them enough." Samanthaknown as Sami to her friendscredits Mr. Powell with influencing her school days and inspiring her college plans. "I always had a love for music, but it was nothing in comparison to my love for it now," Sami says. "Mr. Powell has shown me how to excel, and through him I have found my talent. Music has taken me to numerous honor bands and I am now pursuing a career in music education so that I can teach others everything he has taught me." 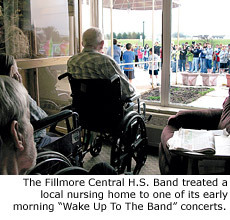 The postive impact of the Fillmore Central High School Band goes beyond band members and extends to non-music students and the community as a whole. What the region lacks in size or financial resources, is more than made up for with a small-town work ethic and unbridled teamwork. And even though the band's fundraiser "wakes up" its neighbors twice each year, this community is already wide awake to the fact that community support breeds success. Photos courtesy of Fillmore Central High School Band.